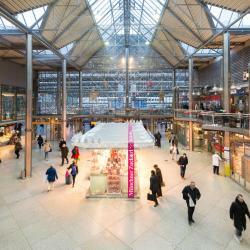 Looking for hotels near Deutsches Museum? BEYOND by Geisel is a residence in front of Munich Town Hall. Guests can enjoy the on-site bar. This modern Bavarian-style hotel is located south of the River Isar in Munich, next to Mariahilfplatz square and the German Museum. This designer hotel is in the Au-Haidhausen district of Munich, less than half a mile from the German Museum. It has a trendy 24-hour bar, underground parking and free Wi-Fi. Renovated in 2018, this hotel offers soundproofed rooms and a spa with swimming pool. 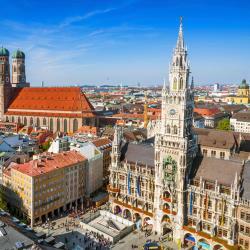 Marienplatz Square and Munich Central Station are 5 minutes away by S-Bahn train. Featuring free WiFi throughout the property, Motel One München-Olympia Gate offers pet-friendly accommodations in Munich. Guests can enjoy the on-site bar. The room was clean, the bed was comfortable and the staff extremely pleasant, quick and efficient. In the very heart of Munich, Hotel Bayer’s provides contemporary accommodations just 320 yards from the Munich Main Station. Free Wi-Fi is available throughout the 3-star hotel. actually every thing was great specially the location and the hotel staff. 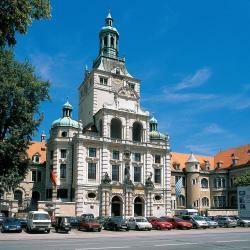 Hotel Metropol stands in a quiet side road, a 5-minute walk from Munich Central Station. It offers free WiFi and air-conditioned rooms. Easy to get to. 2 blocks from the main train station. Close to many attractions. Offering free bikes, Hotel am Ostpark is quietly located in München. Free WiFi access is available. Breakfast can be enjoyed in the morning at the hotel. Staff was so friendly and helpful, the location was near a train station and two great restaurants. This family-run, design hotel in Munich is opposite Ostbahnhof Train Station, a 5-minute train ride from Marienplatz. It lies within a historic building and offers elegant rooms with free Wi-Fi. Perfect location. Staff incredibly friendly. Very comfortable room, massive bathroom. Featuring a terrace, Holiday Inn Munich - City East is set in Munich. Located in the Berg am Laim district, the property provides guests with access to a restaurant. Room is very nice, clean and new. 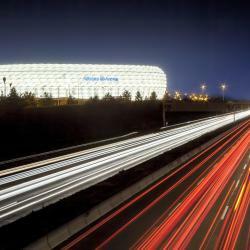 Hotels with great access to Deutsches Museum! Just 2 underground stops from Munich Central Station, this hotel lies in the lively Glockenbachviertel district. Elegant rooms with floor-to-ceiling windows are provided at the Hotel Olympic. Upon arrival we were not impressed at all, but first impressions are not always correct. 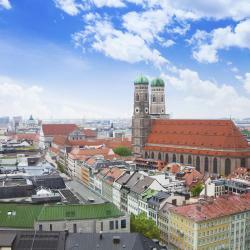 A 2-minute walk from the Marienplatz Square and the Hofbräuhaus Brewery, this hotel in the center of Munich features a free spa, a 16th-century restaurant, and soundproof rooms with flat-screen TVs. Excellent location, clean comfortable room. This hotel is located at the Sendlinger Tor Gate in Munich’s Old Town. Motel One features free Wi-Fi, designer rooms and a trendy lounge offering 24-hour drinks and snacks. This hotel was very modern and exceptionally clean. Family-run for over 100 years and a 3-minute walk from Marienplatz and the Viktualienmarkt Market, this charming, nonsmoking hotel in central Munich offers free WiFi and traditional Bavarian... Staff was helpful and friendly. Breakfast was very good, excellent selection. 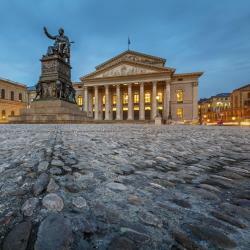 Just 1640 feet from the Bavarian State Opera, this nonsmoking hotel in Munich offers luxury apartments, a pretty courtyard with rose garden, free WiFi in all areas and some modern spa facilities. beatiful luxury hotel studio/apartment hotel exceeds 5 stars .. This quietly located, 3-star Superior hotel in Munich’s Old Town is just a 3-minute walk from the famous Marienplatz square. It has air-conditioned rooms and free high-speed Wi-Fi. Comfortable spacious rooms, very good breakfast, quiet. Dünyanın en büyük sanayi ve bilim müzesi. Dünyanın en büyük sanayi ve bilim müzesi. Muhteşem bir müze, hava ve deniz taşıtları sergileri eşsiz, gerçek bir U-Boat, iki gemi, sayısız sivil ve askeri savaş uçağı ve helikopteri inceleyebilirsiniz. Bunların dışında televizyon ve bilgisayarın tarihi gelişimiyle ilgili de farklı sergileri mevcut. Gezmek için bir gün yetersiz kalacaktır. The mining section (which I last visited in 1977) was closed during my visit. They need to create some quiet spaces. Children running in the building was a safety hazard. I bought my ticket on line and the English version of the website is gramstically inaccurate. I'm in the medical field and I found many of the exhibits difficult to grasp! I think on average, this place would be difficult for a layperson to understand unless you have a background in highly technical engineering fields. Excellent technical museum. Problem is that most info is only in German. Go with a Herman speaker if you can. New exhibit on energy is fully in both English and German. It is very interesting. It's a large museum: allow a lot of time. A little more info in English would be nice, the information is maybe 80% in German and this was a problem for me. Start your visit early or you have the chance to miss what's most interesting in the museum. People are talking about Deutsches Museum! Explore guest hotel reviews featuring "Deutsches Museum"
It is not far from city centre yet very quiet. 5-minute walk to the Deutsches Museum and easy access to subway and buses. Ample selection for breakfast. The Deutsches Museum is a massive science museum, very interesting, and most displays have information in English as well as German.